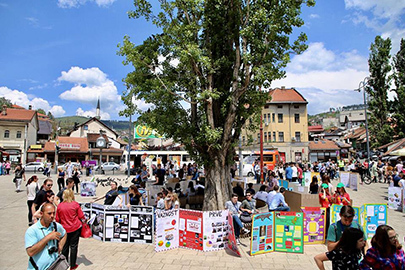 Nearly four hundred students, teachers, and young artists participated in the 20th annual Project Citizen Finals in Bosnia and Herzegovina this year, presenting public policy portfolios that represented thirty-five elementary and high schools. The event was hosted by Civitas Bosnia and Herzegovina (Civitas BiH)–a Civitas International Programs partner–as well as the U.S. Embassy Sarajevo Office for Public Affairs and the state government Ministry of Civil Affairs. Students show their understanding of public policy by applying it to issues that affect their lives and communities. Participants assembled in the Great Hall of the Parliamentary Assembly of Bosnia and Herzegovina on Saturday, May 20, as Paul Horowitz, the United States Deputy Chief of Mission, declared the opening of the showcase. Other notable attendees were Leah Pease, head of the U.S. Embassy Office for Public Affairs; Rahela Dzidic, the U.S. Embassy education specialist; Adnan Husic, Deputy Minister of Civil Affairs; Predrag Damjanovic, head of the Republika Srpska Pedagogical Institute; and, Zoran Matosevic, Deputy Minister of the Middle Bosnia Ministry of Education. Project Citizen teaches students the fundamentals of democracy at all academic levels and provides practical ways for young people to participate as responsible citizens. Students identify a public policy problem in their community. They then research the problem, evaluate alternative solutions, develop their own solution in the form of a public policy, and create a political action plan to enlist local or national authorities to adopt their proposed policy. Participants develop a portfolio of their work and present their project in a public hearing showcase before a panel of civic-minded community members. Students often contact public officials and attempt to convince them to adopt their policy proposal. In this year’s showcase, students explored social problems and advocated for their resolution by suggesting changes to public policy. Project Citizen is one of the many programs led by Civitas BiH. Since its establishment in 1996 as a joint initiative of the Center for Civic Education, Civitas BiH has been viewed as a leader in civic education. The academic and training materials developed by Civitas BiH are the only materials in the official curricula in use by all ethnic groups in Bosnia and Herzegovina’s elementary and high schools. With interculturalism as a focus, Civitas BiH organizes multiethnic youth democracy camps, homestay exchanges, volunteer activities, and school lessons to create a democratic culture in schools. Although the Project Citizen Finals weekend was drawn to a close by Drew Giblin, the U.S. Embassy Attaché for Culture and Education, Civitas BiH continues to promote the goals of increasing civic education and creating a willingness in young people to use democratic procedures for making decisions and managing conflict.